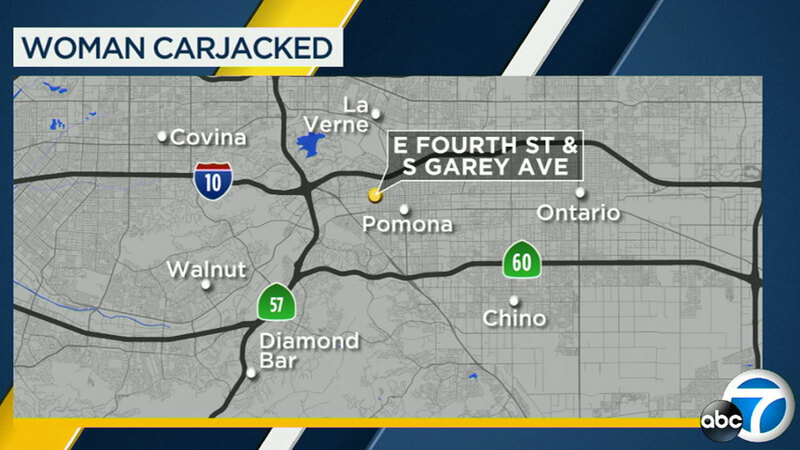 A 19-year-old woman was carjacked at knifepoint in Pomona on Saturday, Nov. 25, 2017. POMONA, Calif. -- A bizarre and terrifying carjacking ended with both the victim and the suspect in the hospital. Police say a 19-year-old woman pulled over to help a disabled vehicle early Saturday morning in Pomona near South Garey Avenue and the 60 Freeway. That's when the suspect forced his way into her silver 2006 BMW 528i, held a large kitchen knife to her chest and ordered her to drive. She says he pressed her leg on the accelerator, causing the car to go more than 100 mph, and grabbed the steering wheel to hit passing vehicles. She fought with him over control of the car and eventually they crashed into a tree on Garey near 4th Street. The victim had moderate injuries. The suspect was thrown from the car and has critical injuries. The suspect was identified as 34-year-old Jesus Mercado. He is expected to face charges including attempted homicide, kidnapping and carjacking.